The humble chip shop has managed to resist the chainification (that won’t catch on, but if it does, I coined it here first) of the British High Street – Harry Ramsden's aside, but this struggling portion of fried nostalgia is the exception that proves the rule and I will surely get round to eating there soon. Yet there’s still a massive appetite (pun intended) for the rumbling giant superbranded fast food place that puts the chip shop into sharp relief – perhaps fried spuds are too amateur to be considered franchisable? I’d like to think it’s the sort of business that’s a labour of love for someone who really wants to invest in their local community. But still. There’s a consistency to the way that a massive chain can command a certain sort of potato – a smaller local chip shop will be at the mercy of its suppliers, but your local behemoth demands something a bit more special – their whole reputation is founded on you trusting what you’re about to get. 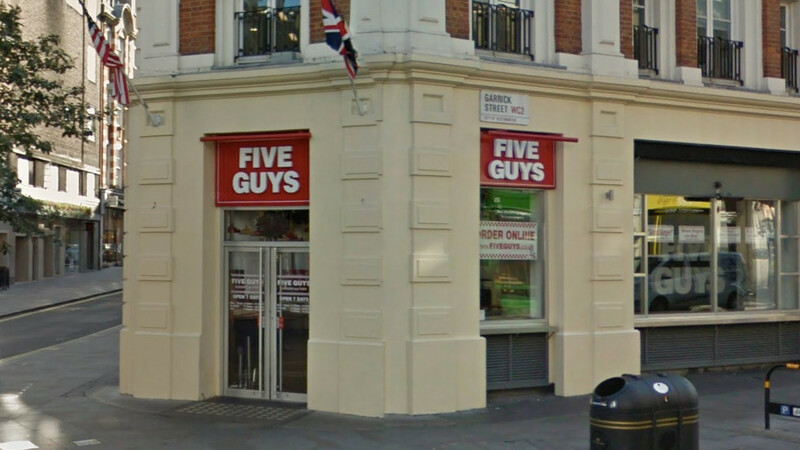 And Five Guys represents the new wave of still another phenomenon, the posh McDonald’s. Much as they might try to install cappuccino-coloured furniture and sell salads underneath the golden arches, it’s never going to happen. But £12 for a burger and chips at Shake Shack or Five Guys? That seems to do the trick. Let’s hope and pray that one never catches on with the chip shop crowd. Let’s face it, the burger is the star of the show at Five Guys, but the chips are not to be overlooked. Signs everywhere inform you that they’re fried in peanut oil, and you’re allowed to scoop a little cardboard tray of monkey nuts for the duration of your spell in the queue at the till. The portions are comparatively generous for a fast food place – your chips come in a large drinks cup, but as you peer inside the brown paper bag your order is handed to you in, you’ll see it’s a little more extravagant that that, an extra scoop of chips sits in the bottom, like styrofoam packing nuts. The perky sprinkling of salt tingles your tongue as you take your first bit of potato, the crunchy skin hits a whopping base note and the fluffy potato wings in as backup. It’s a heady ensemble. Indeed – and bear with me here – the chips at Five Guys taste potato-y, which isn’t always to be taken for granted. One of the fascinating novelties of the Five Guys experience is the drinks machines. I still can’t work out if it’s a genius idea or the most confoundingly stupid application of automated technology since the beastly self-service till washed up on our shores. You choose your drink (eg Coke) via the medium of grubby touchscreen, adding various flavours (eg orange) to your mix so that you end up with the most unholy alliances of gag-inducing magnititude. Three tries in and you’ll be sticking to whatever basic pour of soft drink you would have asked for at the counter anyway. And while we’re on the topic of things that make me feel old, the music is too loud. And as I sit here waiting for spring to arrive, the place is too cold – but what do i know? There’s a heady blend of rock and country tunes blaring out of the speakers, in a bid to ensure that you leave faster. The place is heaving with young, foreign tourists but that’s just Covent Garden. The burgers at Five Guys really ought to be enjoyable – you get to choose everything that goes on them, after all, in what is probably the most pressured multiple choice answer anyone is expected to make since the fastest finger first segment on Who Wants to be a Millionaire? The bread is soft, the meat well-seasoned and nicely cooked. It’s all as you’d expect – an assembly line with a certain amount of panache cranking out the good stuff. The price is fairly horrifying, but just don’t think about it and you’ll be fine. Coaxing you in for a second trip is the marketing department’s nightmare. Have another chip.